It's Illegal to use a cell phone while driving! The internet is out again and the CD's skip. The length of happy buyers is this wide!!!! Welcome to Benjauto now in its 27th years of selling reliable and affordable cars, trucks, minivans, and SUVs and ain’t never been in jail! 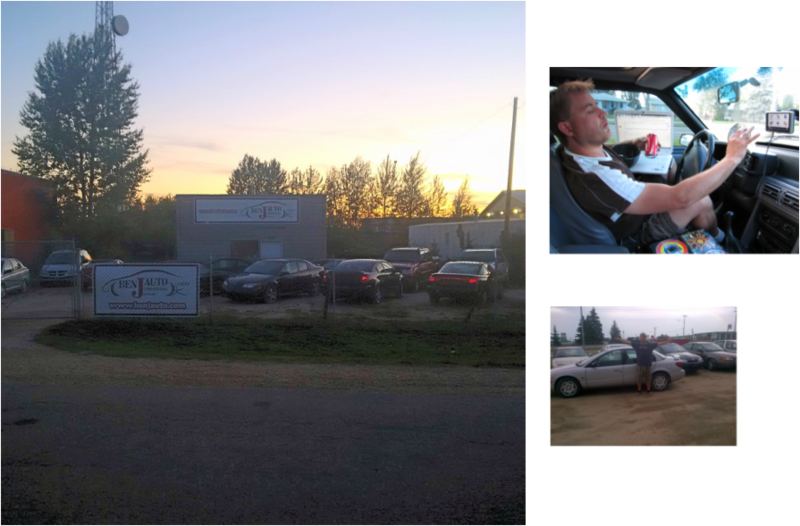 We are Edmonton based AMVIC licensed and able to serve all of Alberta, Steering you right with experience and integrity because OUR GOAL IS AFFORDABLE and RELIABLE USED cars, trucks, minivans, and SUVs Edmonton and area. Statistically to get AFFORDABLE AND RELIABLE together is not easy. If you stumbled across this website looking for safe AND reliable cars, trucks, minivans, and SUVs needing no repairs "for cheeper," it's time to go and thanks for stopping by. We can't even do that and we have all the resources! If you are not suffering from this delusion and just want a fair price on reliable and affordable Edmonton area one stop shopping please keep reading and browse the cars pages! Most cars, trucks, minivans, and SUVs we offer have pre-sale repairs done already at our expense for quality control to offer more AFFORDABLE AND RELIABLE cars, trucks, minivans, and SUVs. The Inspections are mandatory to disclose exactly what you are buying as per what the inspections ask of. Benjauto researches cars, trucks, minivans and SUV’s that work best on a budget. Our judgments and opinions are based on experience. We will not sugar coat anything including having to weed out unrealistic customers as everyone's time is valuable. Photos and descriptions are of the actual inventory. Expected wear and tear will not be photographed. Fair and impartial descriptions are posted. Free warranties have limitations and payment and prices negotiable. $1500 polished turd trade ins will be declared as losers if inspections say so. We ask customers do their own research ESPECIALLY REPAIR COSTS no matter where they buy! Benjauto inventory repeats itself and will advise against models based on inferior engineering and high repair cost we define as non reliable. With no loyalty to any one who builds cars we can provide just about anything within reason Edmonton and area. Car salesmen have a shady stereotype. The awkward anticipation of dealing with these deplorable creatures is understandable and hilarious! We roll with the punches and we take care for our customers seriously. So have a few laughs while browsing at some of our reliable and affordable cars in the Edmonton area. We are not about about being flashy and showing off. A strict dress code of suit and tie is also prohibited! We are low pressure friendly and casual. We want customers to relax and take their time buying one of our reliable and affordable cars trucks, SUVs OR learn a few things and buy elsewhere without a bad taste in your mouth. Click the INVENTORY page for AFFORDABLE and RELIABLE choices. If you cannot afford it we cannot sell it so, INTEREST FREE CAR PAYMENTS, options are available. Being short of cash shouldn’t mean driving a death trap is the answer. Click the EASY PAYMENTS PAGE to see how it works. We don't mess around when it comes to FREE WARRANTY! IF WE SAY IT'S RELIABLE WE WANT TO BE ABLE TO BACK THAT UP!